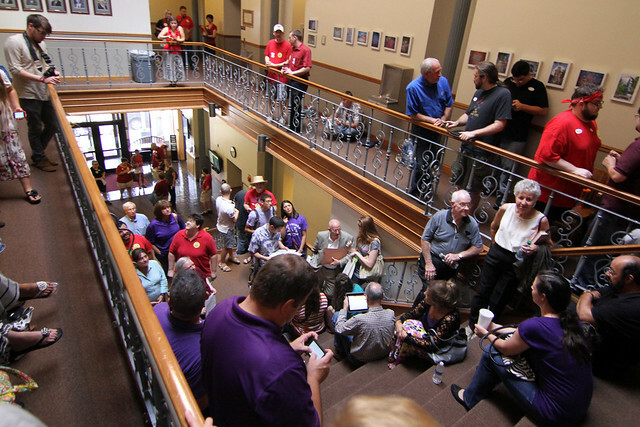 A crowd began forming inside City Hall at around 3 p.m. Tuesday. Fayetteville City Council members passed a controversial anti-discrimination ordinance early Wednesday morning following nearly 10 hours of public discussion and debate that began Tuesday evening inside City Hall. The proposal (PDF here), brought forward by Alderman Matthew Petty, will appoint a city staff member to investigate complaints from residents who feel they’ve been discriminated against during housing transactions, employment decisions, and other public accommodations in Fayetteville. State and federal law prohibits discrimination based on someone’s age, gender, disability, race or religion. But in Arkansas there are no state-level non-discrimination laws that cover the other categories, including sexual orientation and gender identity. Council members Adella Gray, Sarah Marsh, Mark Kinion, Matthew Petty, Rhonda Adams and Alan Long all voted to enact the ordinance. Aldermen Justin Tennant and Martin Schoppmeyer voted against the proposal. During the meeting, aldermen amended the ordinance – at the request of Petty – to exempt all tax-exempt properties or places of worship owned by a church from being included. That move, Petty said, was to appease religious groups who earlier this month said they should not have to open their places of worship to people of different beliefs. Alderman Tennant proposed sending the anti-discrimination decision to the public for a vote in the upcoming general election. He said it would allow all residents to help make the decision, and would likely be quicker – and cheaper – than if the public were to initiate its own vote to overturn the ordinance. 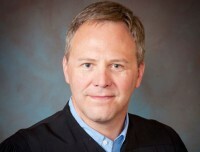 Tennant said residents would only have until about the end of the month to submit over 4,000 signatures needed to place the item on the Nov. 4 general election if they chose to challenge the new law. If they missed the deadline for the general election ballot, a special election would have to be called at a cost of about $25,000-$35,000. Of the 54 Fayetteville residents who spoke about the proposed amendment, 18 people said they would like a public vote. The other 36 residents said they wanted the City Council to make the decision. 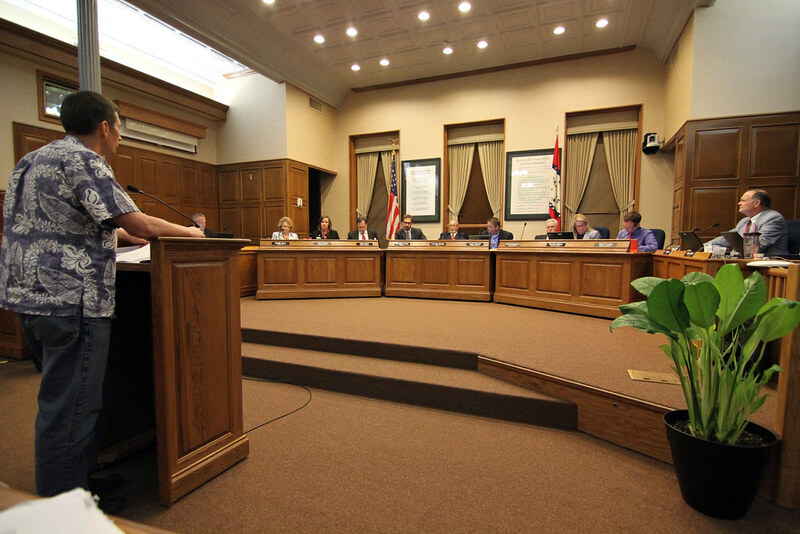 The City Council chambers were full within moments of the City Clerk opening the doors. Laurent Sacharoff, a professor at the University of Arkansas School of Law, said a public vote would be a mistake. “It sounds wonderful,” he said. “But the one time in which democracy fails us is when the rights of a minority are an issue. Sacharoff said minorities face terrible odds when faced with discrimination, and the burden should be on the public to vote for discrimination. Tennant’s amendment failed 2-6 with only he and Alderman Schoppmeyer voting in favor of a public ballot. During the discussion of the ordinance as a whole, residents spoke on both sides of the issue. Jeremy Flanagan, a pastor at Pathway Baptist Church who spoke at the Aug. 5 meeting, maintained that protections based on gender identity will lead to men entering women’s restrooms or dressing rooms. City Attorney Kit Williams said state laws already exist that address people attempting to enter the wrong bathroom for any unlawful purpose – indecent exposure and disorderly conduct. Both, he said, are state statutes that trump all local laws. Others who were against the ordinance said that discrimination is not a problem in Fayetteville, and that the city is already a fair-minded place. Nearly 20 people who spoke at the meeting recounted personal stories where they felt discriminated against in businesses around Fayetteville. One man said he once lost his job in Fayetteville just because he was gay. Another said he has been afraid that landlords would find out he and his partner are gay and would stop renting to them. With the City Council chambers at maximum capacity, residents were only allowed inside one by one as another exited the room. “Fayetteville is a fair-minded place, but it is those isolated incidents of oppression that concern me,” said one resident. Lowell Grisham, Rector of St. Paul’s Episcopal Church, said he frequently hears from LGBT members of his church who have been discriminated against in Fayetteville. “I’ve heard stories from people who have been beaten up, threatened or followed as they left a restroom,” said Grisham. Terry Turpin, a former practicing attorney and current COO at Fayetteville-based company Acumen Brands, said he was against the ordinance for several reasons. Turpin said he was concerned that a disgruntled employee who was fired for a good reason might retaliate and file a complaint against his company. Turpin warned aldermen that if the ordinance is passed, it will hurt businesses in Fayetteville, and will cause other companies to think twice before moving to town. Other residents pointed to a recently released study by the Human Rights Campaign Foundation which found that 91 percent of Fortune 500 companies have implemented policies which prohibit discrimination on the basis of sexual orientation, and 61 percent have protections in place on the basis of gender identity. 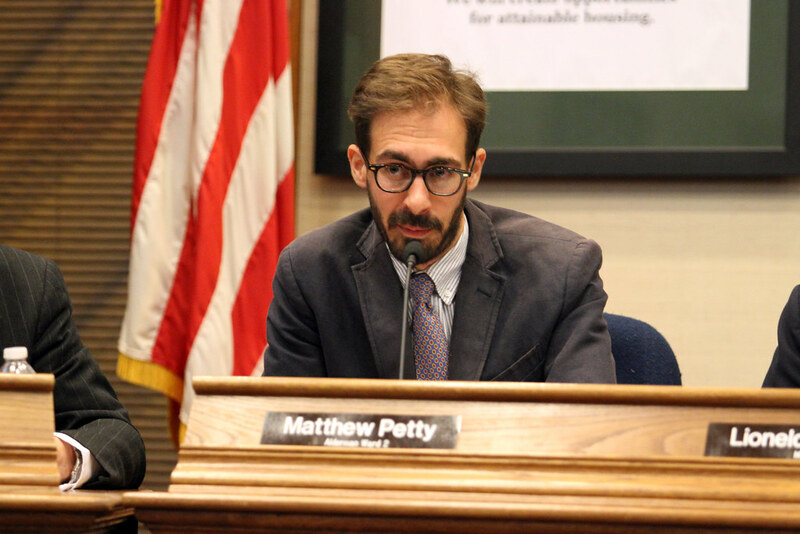 Ward 2 Alderman Matthew Petty proposed the new ordinance. Turpin also warned aldermen that the ordinance is overreaching and is a violation of state law, but City Attorney Kit Williams said civil rights are not a state affair, and that municipal governments have “clear authority” in Arkansas to enact ordinances such as the one proposed in Fayetteville. After public comment ended, 73 Fayetteville residents had spoken about the ordinance. 49 people were in favor of the proposal, and 24 were against it. 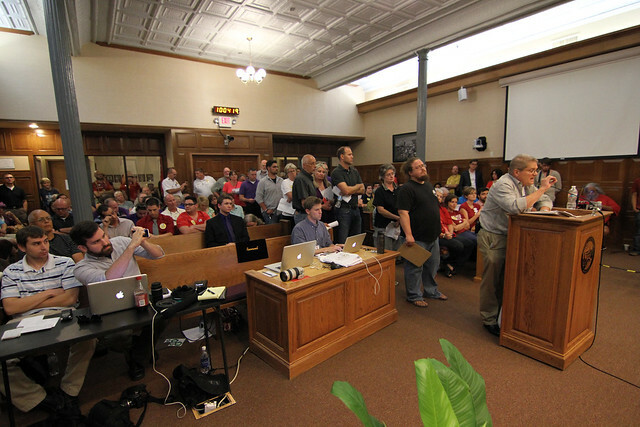 Of the 14 non-Fayetteville residents who spoke, only one was in favor of the ordinance. Before the vote, Alderman Tennant said he knows discrimination exists and that he believes in the spirit of the ordinance. But, he said he felt it was irresponsible to enact an ordinance without knowing all the details involved with enforcement. Mayor Lioneld Jordan said earlier this month the new civil rights administrator position would be filled without adding any new employees to the city’s payroll, but could not say which staff member would assume the role. Tennant suggested the Council instead form a Civil Rights Commission made up of residents and aldermen who could investigate claims of discrimination. “I just don’t think there’s any one person in this city capable of administering this ordinance on their own,” said Tennant. 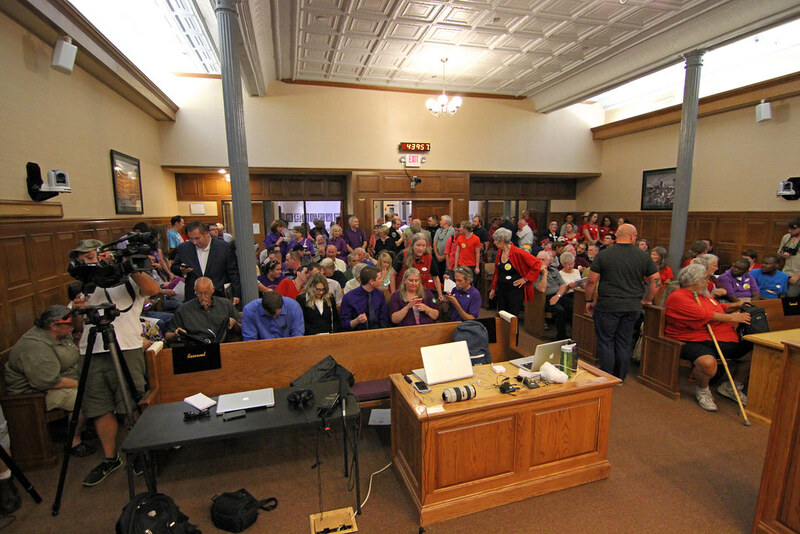 The meeting was the longest in the history of the Fayetteville City Council, lasting until 3:45 a.m.
Kinion said after hearing an outpouring of stories from residents who’ve felt discriminated against, the time to enact the law is now. Council members Gray and Marsh said they weren’t afraid to pass a law that might eventually need to be tweaked. Fayetteville Mayor Lioneld Jordan closed out the discussion with strong comments in favor of the ordinance. 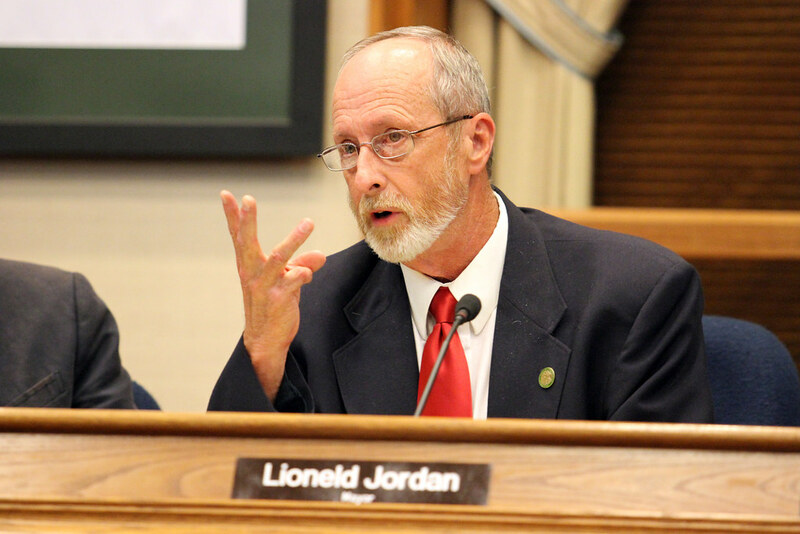 In his final comments, Mayor Jordan defended his qualifications to handle a new law. Jordan said during the downturn, the city enacted a business license program and an anti-solicitation program without adding any new jobs to the payroll. Jordan urged the Council to approve the ordinance. “We have three classes of people that are not protected by the 1964 Civil Rights Act and I think that’s wrong,” said Jordan.